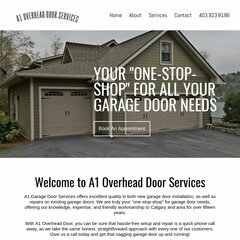 a1garagedoor.ca Garage Repair Calgary, Garage Door Repair Calgary, Overhead Doors ..
Media Temple Inc (California, Culver City) is the location of the Apache/2 server. The programming language environment is PHP/5.3.15. ns2.mediatemple.net, & ns1.mediatemple.net are its DNS Nameservers. PING www. (205.186.187.182) 56(84) bytes of data.